Okay, I was pretty excited to play this game. Why? Because working inside of a hospital cooperatively seemed pretttttty awesome! Anyways, we’ve had a chance to play it now (one solo and four five-player games), so let’s get to the Healthy Heart Hospital review! What is Healthy Heart Hospital? Healthy Heart Hospital is a cooperative simulation game that is all about running a hospital efficiently. You and your fellow doctors must work together to turn it into a prestigious hospital. This game was designed by Anna-Marie Nelson and Scott Nelson and published by Victory Point Games. We are not going to be teaching you all of the Healthy Heart Hospital rules here, but hopefully you will get an idea of how the game works. Each round of the game consists of three phases: Ambulance Phase, Player Phase, and Housekeeping Phase. During the Ambulance Phase, you will turn over two Ambulance cards and add as many random cubes to the Waiting Room as are written on the cards. Then you will draw a cube for each patient in The Wards. There are five different colored areas representing the patients’ needs (Infectious Disease, Psychiatric, Internal Medicine, Cardiology, and Trauma). 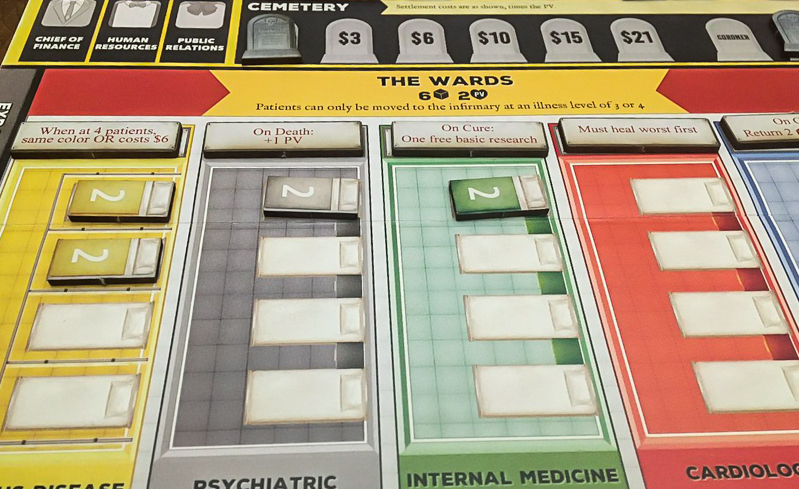 By default, patients only have five illness levels, so they will die if five of one colored cube has to be placed in the Waiting Room or if they ever reach level five in The Wards. When drawing cubes for The Wards, you will be hoping to avoid drawing a cube of the same color as the current patient. If you do draw their color, their illness level worsens. Each room in The Wards will have random modifiers attached to them that can help or hinder you throughout the game. During the Player Phase, each player has a chance to use his or her actions and abilities. These actions include curing patients, transferring patients to new rooms, adding new rooms to the hospital, hiring and assigning new staff, and researching. The new employees, new buildings, and training markers (earned by researching) all make running the hospital a bit easier. During the Housekeeping Phase, you will put all of the used cubes back in the bag/cup and you will check to see if any of your buildings or staff give you bonuses during the phase. Throughout the game, you will be trying to improve your prestige and money levels. These levels will be going up and down based on how well you take care of your patients. You will need to keep both levels up if you want to hire new staff and build new rooms. If you ever run out of money, everyone loses. You will win the game if you are able to go through all of the Ambulance cards. You can also (kind of) win if you’re unable to hide a dead patient, which happens after you run out of spots in the cemetery. In both cases, you will use the chart in the rulebook to figure out what your final score means. The theme works very well here, which is great since this is possibly the only cooperative board game set in a hospital. You really do feel like you’re working in a busy hospital trying to take care of patients with a limited staff. Healthy Heart Hospital has a ton of replay value. You will always have random patients, random abilities, random New Hires, and different combinations of hospital extensions in the game, so it’s a different challenge every time you play it. This is a game that you could still be playing years from now if you enjoy it. This is not the most attractive game to look at when it’s on the table. We don’t mind the retro-style artwork, but the colors are a bit dull. Unfortunately, I think this is enough to keep some people from buying the game. The theme is great, but it could have been even stronger with better art. 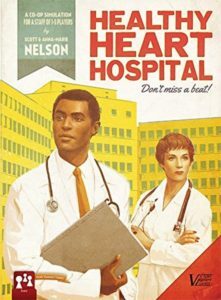 If you don’t like a ton of luck in your games, chances are you’re not going to enjoy Healthy Heart Hospital too much. Your chances of winning depend highly on your early cube and token draws, so you could lose even if you do everything right. I kind of like the randomness since it adds to the theme (you never know who’s going to come through the hospital doors), but not everyone in my group shares my opinion on this. On the overall, we had a good time playing Healthy Heart Hospital. There’s a pretty good chance we wouldn’t like it as much if it had a different theme, but as it is it’s an above-average game. Our group as a whole does not like the artwork, but that’s not enough to keep us from playing this one again. I do have to point out, though, that twice we switched over to Pandemic right after playing this game, so take from that what you will. If you know that this is a theme that you’ll like, then chances are you will enjoy Healthy Heart Hospital. If you don’t like luck-based games and could take or leave the theme, then you’ll probably want to pass on this one. Thanks for taking the time to read our Healthy Heart Hospital review!